There’s an incredible play at The Rose right now. 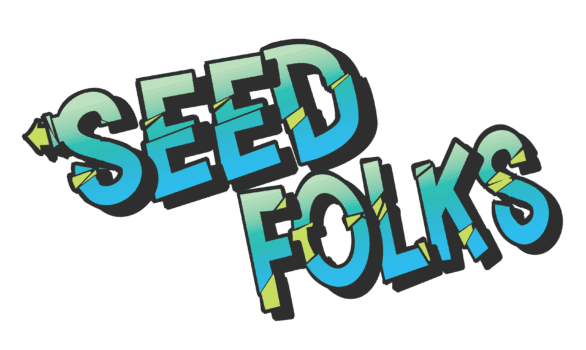 “Seedfolks” is a little different than what you’re used to at the theater, but it’s exactly why I think you need to see it before it ends this weekend. It’s about the transformation of a immigrant community in Cleveland, all thanks to a community garden that began with one young girl planting seeds. Disclosure: I received complimentary tickets so I could write this review. “Seedfolks” is a one-woman show featuring Sonja Parks playing 20 different characters. She does this seamlessly through voice and posture, and with the help of light and music changes sometimes. I loved it. It was a challenge for my younger daughter, who’s 6, to keep track of everything, though. The set is minimal, though there are video projections to help set the scene. This show is recommended for ages 8 and older. 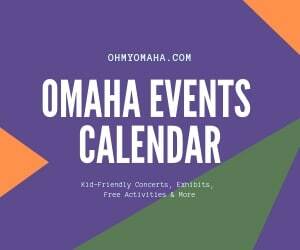 There are some themes that you don’t typically encounter with children’s theater, or at least, for the shows I’ve been to with my kids since only one has recently turned 8. There are mentions of marijuana, gang shootings, and racial tension. The characters in this community are realistic and dealing with very real problems. Pre-show music is pretty awesome and you might feel like dancing. Post-show, plan on sticking around for the Q&A with Parks. This show is one hour without intermission. Go ahead of time. It’s children’s theater, and only an hour long, but not for the itty bitty. I’d stick to the 8 and older recommendation. My 6-year-old said she liked it, but I could tell it was hard to follow and not as exciting as some of the shows she’s seen at The Rose. She got antsy toward the end. My 8-year-old seemed pretty into the show the entire time. As mentioned before, some of the characters in this realistic play talk about troubling things. 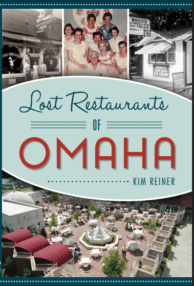 Make it a complete date and check out my favorite places for post-theater treats in Omaha. Ice cream, anyone? Yes. This is children’s theater at its best. It was thought-provoking. It had funny moments. It was fantastically performed by one actress. 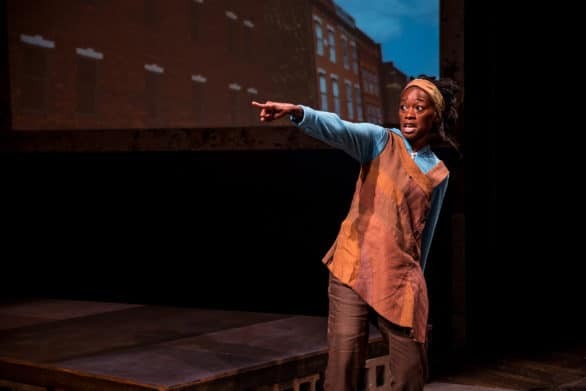 “Seedfolks” is based on a book by Newbery Medal-winning Paul Fleischman about an immigrant neighborhood in Cleveland, Ohio, that is transformed by a community garden. 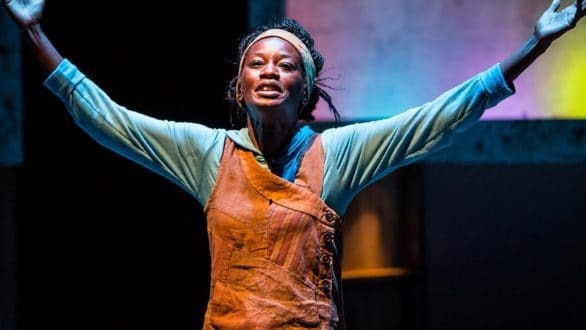 Aided by video projection and a lively mix of recorded music, a dozen distinct and diverse characters are brought to life by Ivey Award-winning actor Parks, named a featured artist by TIME Magazine and one of “Seven Artists You Must See” by American Theatre magazine. “Seedfolks” begins as 9-year-old Kim plants the first seeds in the vacant lot next to her apartment building. They are six lima bean seeds, planted in honor of the father she never knew. Soon, each member of Kim’s neighborhood finds a reason to plant their own seeds, resurrecting a derelict lot and uniting a fractured neighborhood. The show was originally developed by the Children’s Theatre Company of Minneapolis under the direction of show director Peter C. Brosius, and The Rose is has brought that CTC production to its mainstage. In May 2017, CTC’s production of “Seedfolks” was selected from over 800 works worldwide to represent the United States at the prestigious ASSITEJ International (International Association of Theatre for Children and Young People) World Conference in Cape Town, South Africa. Cost: Tickets are $20. Discount ticket vouchers are available for $16 at area Hy-Vee stores. Members of The Rose receive four free tickets to the production. Purchase tickets here.